The Autobiography of Ben Franklin is a must read for any student studying American History from fifth grade to University Level. 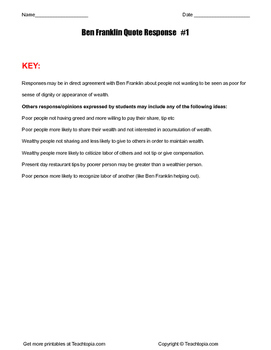 Student are to write about this statement. I provided some key questions for the students based upon the quote and also gave an answer key to guide the teacher and hopefully class discussion in terms of this quote and the way it could be interpreted and analyzed in the classroom. 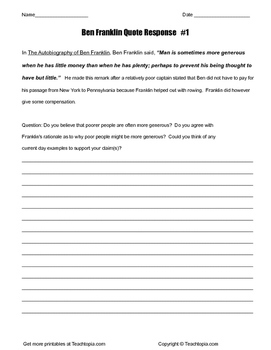 This Ben Franklin writing assignment was created by Jody Weissler for the Teachtopia Education Network.